The Adult Merchant Account back reporter system is a central resource that provides information, support and facilities to help you manage your accounts. From here you can make full or partial refunds, change login and passwords and other account information, view statements, and a whole lot more. After completing the installation of the Reporter you will be able to access it from the “Start” menu on your PC. You will be prompted to enter a username and password that will have been supplied to you. This section describes basic functionality you’ll use for most of your Reporter actions. They are located above the tabs. Auto log off after x minutes idle (default : 15). Grid row height (default : 19). 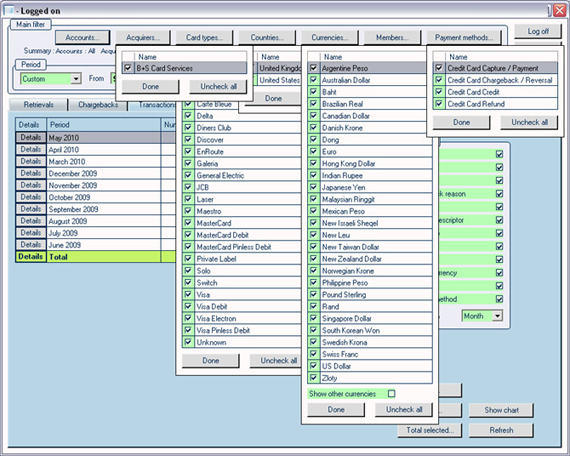 This option is available for all tabs and creates a CSV (comma-separated format) or Excel (tabular) record file of the currently queried data. These types of files can both be opened with e.g. Microsoft Excel. In this tab you’ll find all your individual payments for credit card (captures and payments) and other payment methods like Direct Debit, iDeal and more in their original currencies. In this tab you’ll find all your individual authorizes, captures, credits, payments, refunds and voids in their original currencies. In this tab you’ll find all your individual chargebacks in their original currencies. Use the Details buttons to see the original payments. In this tab you’ll find all your individual refunds in their original currencies. Use the Details buttons to see the original payments. In this tab you’ll find all your individual retrievals in their original currencies. Use the Details buttons to see the original payments. A retrieval is a chargeback announcement (creditcard only). In this tab section you’ll find the totals of the Payments, Chargebacks and Refunds tabs. You can convert them to one currency or split them off into their original currencies. This tab can also show charts. Shows the totals of all Credit Card transactions. Basically the same as the Totals tab filtered on Credit Card payment methods. All actions assume you have started the Reporter and logged in successfully. 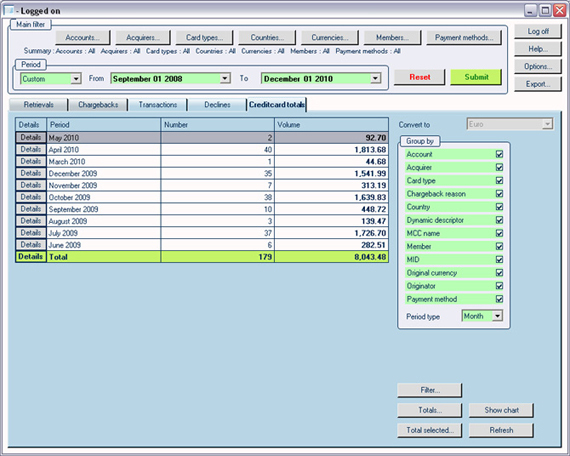 To query for totals you can click on any tab containing the word "total". Totals are the sum of transactions grouped by time, number and amount. 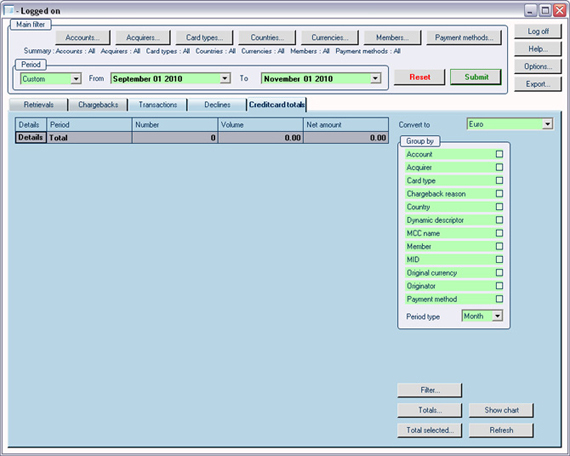 The following totals tabs can be available : Orders totals, (Payments) Totals, Creditcard Totals, 0900 Totals, Other Totals. To query by time you can adjust the time filter options by specifying date / time or select one of the options in the list box. After that click on Submit or press enter. Go to the Payments or Transactions tab to list individual transactions. Use the "Filter..." button to view / adjust any tab-specific search options. These will combine with your settings in the Main filter. Use the "Date independent" checkbox to ignore the date from the Main filter and search the whole available period (1-1-2006 till now). More information can be obtained by clicking the Details button of the individual payments. This procedure works the same for the Chargebacks, Refunds, Retrievals and Orders tabs. Go to the Payments or Transactions tab. Click on Details in the desired record to show the Refund option. Press Submit to perform the refund (only for captures, payments and direct debit transactions). You can perform a (partial) Refund by specifying an amount in the Amount box. If you do not specify an amount, it is assumed you want to refund the whole amount. The same goes for performing a Void or a Capture (authorizes only). Voids can not be partial however and to partial Captures some acquirer-specific limitations may apply such as only 1 per transaction. In order to perform these actions your login needs to have special permissions. If you can't perform a certain action which you need to do, please contact us so we can update your permissions if applicable. A support email and phone is supplied once the account and reporter are set-up. We also offer a help manual to facilitate ease of use of the Reporter.